Editor: Have you been around in OB long enough to remember “Hitchhikers’ Corner”? It was a site right next to the gas station as you’ve leaving Ocean Beach where folks who wanted a ride would stand with thumbs outstretched or holding signs where they’d like to go. It was a dirt lot, but people would gather at all times of the day and night. And it worked: many, many people would stop and open their vehicle doors to complete strangers! Imagine that! Well, now we have “the Hitchhikers’ Guide to Ocean Beach” – a series about the interesting and little known quirks of OB. “Citizen Cane” is the nom de plume for a local historian of unknown proportions and known wisdom. Please welcome him or her. We look forward to more of these attractions. This is the first part of a series of stories to give people a view of Ocean Beach that can’t be found in the usual tourist guide books. Our first attraction is the Sideways Tree of Ocean Beach. The tree is in plain view across the street from the Holy Trinity Church on Sunset Cliffs Boulevard near Brighton Avenue. It’s rarely noticed by the people passing by. Tour buses don’t slow down at this attraction. Most of the people driving by are too focused on going to or from Ocean Beach. Many people fail to look up. 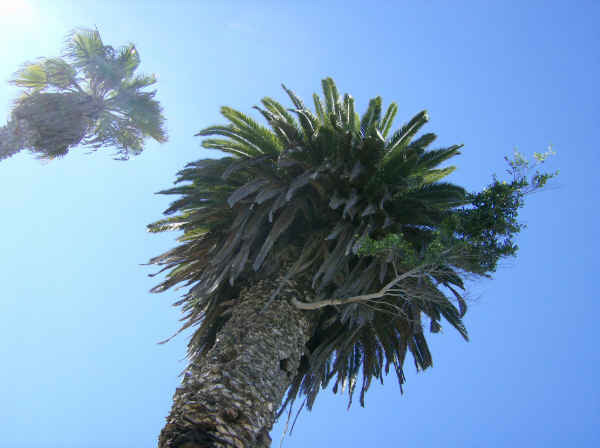 The tree is high up on the side of a large palm tree growing on private property. Such a tree probably wouldn’t be allowed on public property. Many trees around here have a tendency to grow toward the south, but the sideways tree lives a contrarian lifestyle. It grows more to the north in the direction it was planted. It also defies geotropism by growing taller in a mostly horizontal direction. Some people I’ve spoken to call it a parasite. I think that’s a bit harsh. I can’t fault the tree for where it was planted. Rather I see it as the poster child for growing where you are planted. You can call it whatever you want. Interpret it as you will. I list it here in the Hitchhikers Guide as the organic monument to the nonconformists of Ocean Beach. You have to lean completely one way or the other to correctly view this tree. wait, the tree is that small branch?! wow, thats a stretch. So many other things to cover Lets start w/ old Hodad’s/Jim Bell’s casa. Or the managers booth @ Apple Tree. Or the rooftop apartments that are along Newport Ave. Or what is REALLY inside the police trailer by the Pier. I say thats where the Keep Bums Out stickers are really being made. Funny, funny OBWarZone. Why not draw up a list of your own and we’ll either post yours or send them to Citizen Cane so they can be incorporated into the Hitchhikers’ Guide to OB. I’d always believed that it was a rumor that the police trailer was simply a “cover” for porta-potties. I figured something more had to be going on in there. Until early one morning before the Ocean Beach Music Festival when I wandered down the alley above the pier parking lot to see a flat-bed trailer and a crew removing the porta-potties from the trailer. Then they moved the trailer itself. For a minute I thought they’d decided that parking was more important than the police officers having a good place to pee. I was wrong, though. The trailer and it’s porta-potties came back after the OBMF was over. It did give me cause to think about the lack of publically accessible bathrooms in our community. Just last week I was wandering down the same alley when a white SUV with four young folks in it pulled into the parking lot and parked against the back wall of lot. All four of the guys jumped out and pissed in the parking lot. Maybe instead of proper public facilities we could simply turn the sidewalk along the seawall into a super-sized urinal that flushes into the ocean, ’cause that’s effectively what we are providing right now. It’s disgusting that this community doesn’t address this problem, ’cause guess what… people will always have to pee and they aren’t going to the lifeguard station. We need to either place potty police in the alleys and on the sidewalks to ticket and fine the pissers, or we need to put porta-potties in accessible areas, just like we do for festivals. If the cops and meter maids had to use the actual “public” facilities perhaps there’d be more effort to patrol them and keep them cleaner and safer. Sarah, maybe this deserves its own post, eh? What do you think? The Police Trailer has been a bug-a-boo for a number of residents for about a decade at least. When OB Grassroots Organization first got started in 2000, a number of activists were then trying to get the trailer to be removed. But obviously to no avail. I’ve actually been in the trailer and can confirm that there are desks in it. More recently, I’ve been told that OB’s meter maids and misters use it to do their paperwork. But, hey, if you’d like to write up something, we’re game. I’m not sure I would want to do any paperwork in a shed full of porta-potties. But hey, maybe I’m spoiled? I’ll think about a proper potty-problem post. You know I’m committment phobic and all…. Ha, almost did the same thing Sarah. Decided I’ll have to go back by bike and check it out another time. And didn’t you hear? We’re building a half-million dollar artistic masterpiece of a bathroom to replace the one that got torn down like a year ago…it’s even going to have almost as many stalls as the one that was removed did! A big problem with bathrooms, and one that will probably plague us a long time, is ADA compliance. In lots of cases shop owners can’t modify their bathrooms to provide wheelchair access, in even more they can’t afford to. Since they’ve got to be fair to everyone, that means they legally can’t allow able-bodied customers to use their facilities, because they wouldn’t be able to extend the same courtesy to the disabled if they wanted to. Hey Dave… I get it about the ADA compliance, and having spent some time in a wheelchair and even more time on crutches/cane, etc., I can vouch for the importance of the ADA regulations. I also find the rules to be crazy in many cases. I was once required, while remodeling an office building, to make sure the bathroom we added upstairs was ADA compliant. I was not, however, required to put in an elevator so the disabled folks could get to the ADA compliant bathroom. The downstairs bathroom, being grandfathered into the pre-ADA rules ’cause it was already existing, wasn’t required to be compliant. I kinda like the new bathroom design and don’t find the cost to be all that out of line, but it doesn’t go far enough towards solving the problem. Well eventually every bathroom has to be replaced, and law says that if it is then upgrades have to be made, right? That’s just going to be a long time coming…and while the rules might be crazy in some aspects, I’m not going to argue that they don’t serve a purpose at all. I like the new bathroom design too, and for what it is the cost isn’t incredibly exorbitant. Of course, I’d prefer to see another couple public restrooms along the beach, maybe one up by Dog Beach and another between Brighton and the lifeguard tower, and would’ve settled for something more boring and utilitarian (like the old structure) to save money if we could’ve gotten more facilities, but it was explained during meetings on the concept that running water, sewer, and power to new locations was what was even more cost-prohibitive than the building itself, and that coastal permits would be difficult to obtain as well. Citizen Cane – totally sorry for your thread hijack – no more poop talk from me, I promise! 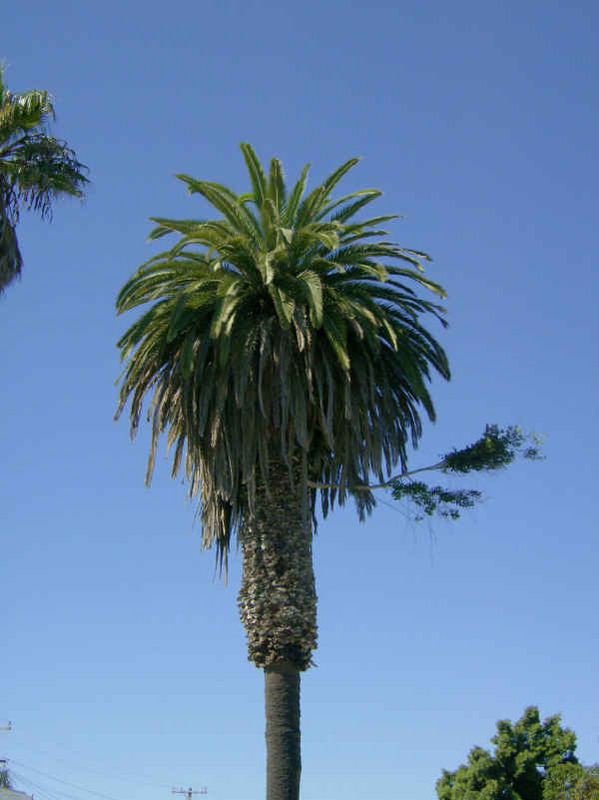 i would wager that some bird took the seed into one of the holes up there in the palm tree and forgot about it. and the seed sprang roots and the sideways tree lived happily ever after. any idea citizen cane how long the sideways tree has been the sideways tree – in other words, any idea of how old it is? I can’t remember when I first noticed it. Maybe six or seven years ago. I was both surprised and relieved when it survived a wicked wind storm last Winter. That same storm completely sheared the top off a palm tree just across the street. Cane – do you know what type of tree it is? One of our readers asked that. I’m not sure, perhaps a ficus perpendiculus. thanx, Citizen Kane, for pointing out this magnificently thriving tree. So nice to know that Nature still has a few tricks up its sleeve. every now & again, as I stroll thru OB, either on foot or bicycle, I see this tree. It gives me cause to stop and ponder Nature taking its own course, defying rhyme or reason, and thriving in an unexpected location. Feels very natural to me to see such envelope pushing life forces. Perhaps thats why I love OB so much. it, too, seems to defy convention and thrive in its own way. Idea for another Hitchhiker’s Guide to OB attraction: the secret garden next to the Blue Parrot. Just FYI, we did a couple articles on the secret garden. Do a search on our search bar on the homepage. The sideways trees are probably seeds that birds poop out or seeds in the fruits the parrots eat. The seeds end up rooting and growing up on the tree.